Anthony Telford pitched well enough this day in 1990 to gain praise from his manager, Hall of Famer Frank Robinson. He also pitched well enough - one hit over seven innings - to beat the defending World Series champion Oakland Athletics and do so in his major league debut. "It was a tremendous effort," Robinson told reporters afterward. "He showed a lot of poise and savvy--he made some pitches when he had to make them. He kept them off balance. That's what pitching is all about." Telford went on to see time in nine big league seasons, but he didn't become a major league regular until seven years after that Oakland game. He did so as a reliever with the Expos. Telford's career began in 1987, taken by the Orioles in the third round of the draft out of San Jose State University. Telford was also credited as Tony Telford. Telford played his first season with the Orioles between short-season Newark, single-A Hagerstown and a single game at AAA Rochester. 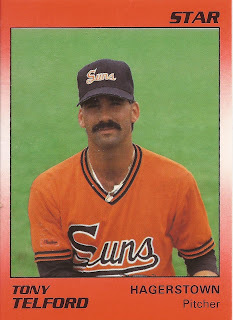 He played 1988 back at Hagerstown and 1989 at single-A Frederick. 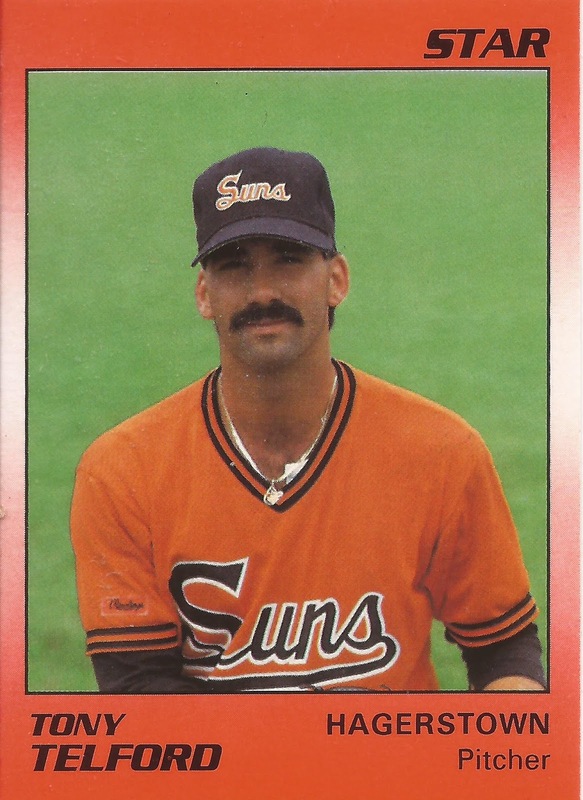 He started 1990 at Frederick, hit AA Hagerstown and then got his call up to Baltimore that August. Telford got eight starts for the Orioles that year. He went 3-3, with a 4.95 ERA. He nine outings for Baltimore the next year, one start. He then saw only three more major league relief outings through 1996. He went through the Braves, Indians and Athletics systems before he landed with the Expos. He returned to the majors with 65 relief appearances for Montreal in 1997, then 77 the next. He talked up his team after a June 1998 outing where he went 1.2 scoreless. "No matter what everybody says about our club, we've got some good ballplayers," Telford told reporters. "We've got guys with a lot of heart." Telford stayed with the Expos through 2001. He then played his final season with the Rangers in 2002. Years later, Telford cited his faith as central to his career in a talk given at a university banquet. "I was a believer but also a fierce competitor," Telford told the Campbellsville University players. "That's what pushed me into having a successful major league career and being able to provide for my family."